In our Lenten journey, have we discovered that we are studies in contrasts? Did we begin with great aspirations and are now feeling more than ever our fickleness? If so, we are truly ready for Palm Sunday. Today, in the universal Catholic Church, we rise during Mass to hear a full reading of the Passion of Christ. What is our disposition today, having spent nearly 40 days praying, fasting, and doing acts of generosity? Most of us start Lent with some sense of seriousness about our relationship with God. We welcome a whole season in which we seek to know and love Him better. Is that happening? Are the results mixed? For many of us, Lent becomes a time to face ourselves. Sometimes we discover that our resolve never quite bears fruit. We can surprise ourselves when we notice our laziness, distractibility, or superficiality. The disciplines that seemed so promising at the outset—“This will be a spiritual Lent for me!”—get a little burdensome, a little inconvenient, too easily forgotten. The contrast in us between our desire for God and our love of ourselves can, in a penitential season, become sharp. When this happens, we should not despair. On the contrary, we should recognize that this is precisely what Lent is meant to teach us—we need a Savior! We are in way over our heads. Life is full of contrasts. This story, being completely human, is as well. However, Jesus brought the Divine into the human story. He shows this by predicting the future several times throughout the Gospel account (the re-telling of the story of the anointing, the room that will be prepared for the Passover, Judas’ betrayal, the Bridal Feast of heaven, the scattering of the apostles, Peter’s denial). Yet it is the centerpiece of this drama that explains what we most need to know today: what Jesus is about to undergo—suffering and death—He does for us, to forgive and heal all our contrasts, all our waffling between light and shadow. Knowing all our failures, He gives to us His Body and Blood, sealing us into an eternal covenant with the One toward Whom we always strain but, left to ourselves, usually fail. If we think of the Passion story as a mural, we will “see” that it is shot through with lights and shadows. Taken in all at once, we find they provide depth and texture to the story, giving richness to the drama that changes everything for us. The contrasts actually clarify the intersection of the human and Divine. We begin to realize that the mercy of God is made perfect within human unsteadiness. Jesus entered this world of lights and shadows and conquered it—for us. Possible response: Lord Jesus, thank You for being the Stillpoint of all my swirling contrasts. Help me keep my eyes on You as I make my way through Holy Week. The prophet, Isaiah, because he lived during a time of great covenant unfaithfulness in God’s people (about the 8th century B.C. ), had to deliver dire warnings of coming catastrophe unless the people repented. He prophesied that judgment would inevitably fall, but Isaiah also spoke of a coming restoration, when their punishment would end, and the people would once again flourish in their land. Remarkably, Isaiah’s prophecies included detailed descriptions of a Suffering Servant who would play a significant role in this restoration. Through his innocent, willing suffering, the sin of the people would be expiated (paid for) and forgiven. Here, of course, we have an astounding Messianic prophecy of Jesus, the Innocent One Who suffered on behalf of all people, making our redemption possible. There are several “songs” in Isaiah about this Suffering Servant. Today’s reading highlights the determination of the Servant to stay the course set out for him, regardless of the physical violence and acts of degradation against him. 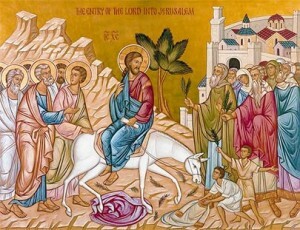 To those of us who arrive at Palm Sunday feeling the weight of our flawed humanity, the “Suffering Servant” speaks: “The LORD God has given Me a well-trained tongue that I might know how to speak to the weary a word that will rouse them.” What blessed refreshment as we reach the climax of our Lenten journey! Possible response: Lord Jesus, I do grow weary of myself during Lent; how thankful I am that You have paid for all my failures so that I can have new life. Help me choose that life today. We can’t read this psalm without being amazed at how accurately it describes some of the details of the Crucifixion. That is why we understand it as a prophetic Messianic psalm, written by David, King of Israel, hundreds of years earlier. David, like Jesus, was persecuted unjustly. His enemies wanted to destroy him, and his suffering made him cry out, “My God, my God, why have you abandoned me?” However, in a verse not included in our reading, David acknowledges that God has not forsaken him: “For He has not despised or abhorred the affliction of the afflicted; and He has not hid His face from him, but has heard when he cried out to Him” (Ps 22:24). This is the turning point of the psalm. In contrast to his suffering, David goes on to see a time when he will be restored and be able to “proclaim Your Name to my brethren in the midst of the assembly” (Ps 2:25), even being able to “eat and be satisfied” (Ps 22:26). In other words, David sees life after his suffering, something wonderful from God on the other side of it that will cause all Israel to “give glory to Him…revere Him” (Ps 22:23). Is it any wonder, then, that this psalm was on the lips of Jesus as he was dying on the Cross? The separation from God He experienced as He bore the full weight of all humanity’s sin made Him feel abandoned, as did David, but He had the hope of the psalmist, too: “Posterity shall serve Him; men shall tell of the LORD to the coming generation, and proclaim His deliverance to a people yet unborn” (Ps 22:30). We cannot doubt that this psalm, known so well to Jesus, gave Him courage as He drank His cup of suffering to its bitter end. St. Paul gives us a summary of the Incarnation and, with it, a preview of what lies beyond the sober details of today’s Gospel narrative. Jesus left His glory in heaven to become one of us, yet He became more “us” than we are ourselves. God made us for obedience to Him, which would enable us to live in His “image and likeness” and be truly happy. We, however, often choose disobedience (as Lent, perhaps, is teaching us); on our own, we never really reach who we actually are. Jesus chose perfect obedience for us, even unto death. Therefore, God gave Him the Name that will eventually cause every knee to bend and every tongue confess that “Jesus Christ is Lord.” In all our other readings today, we see the “Suffering Servant” stripped of power and glory, the very image of weakness and defeat. In this epistle, we see King Jesus, exalted and glorified and worthy of praise—the perfect anticipation of the joy of Easter! Possible response: King Jesus, help me to believe that the way of humility and obedience is always the path to glory.